There are no conflict-free communities. But it is literally a question of life and death how communities address their common issues and whether they can learn from previous mistakes. Inescapably, this question came into the foreground two years ago, on the occasion of the 70th anniversary of the Holocaust in Hungary, full of commemoration events all over the country. 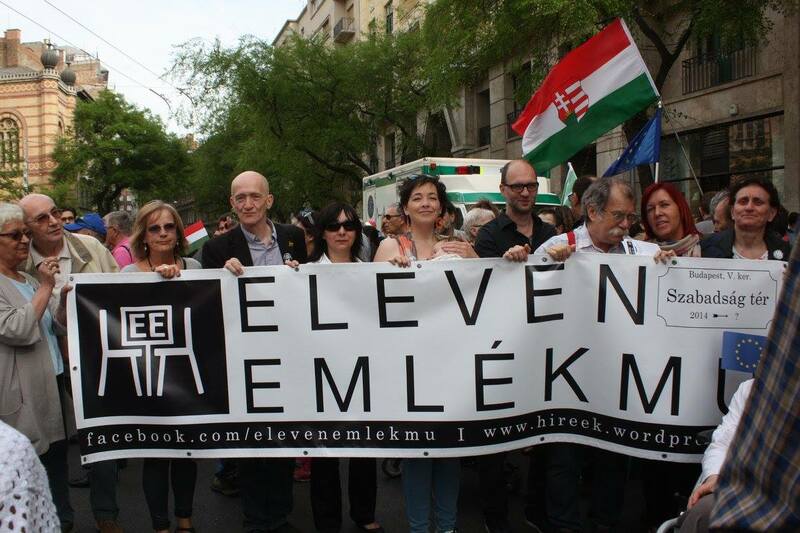 The Budapest-based activist group, Eleven Emlékmű (Living Memorial) has been keeping this idea alive for more than two years, constantly reminding us how much there is still to do. 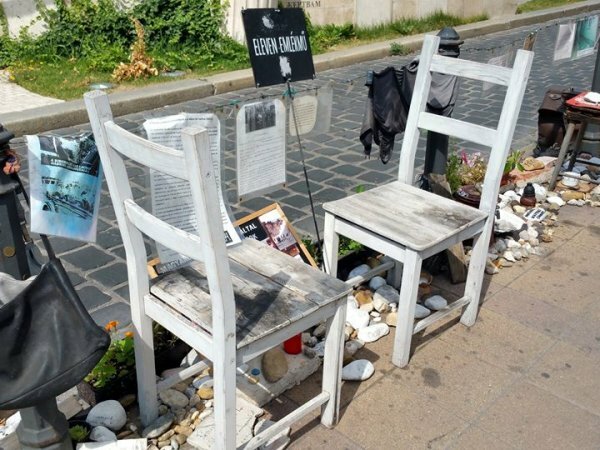 Living Memorial was established in 2014, during the Hungarian Holocaust Memorial Year, which consisted of a wide range of cultural and social events. It would be impossible to list all of the numerous programs so I will just name a few examples that I personally witnessed or participated in, to illustrate how many people got involved and in how many ways, in this essential effort of collective memory to come to terms with one of the most tragic chapters of Hungarian history. Besides the annual acts of commemoration linked to April 16th, the Memorial Day of the Holocaust in Hungary – in memory of the dreadful date when the deportations to concentration camps began – or the traditional March of the Living (cf. Agnes Kelemen's piece), this year offered several further occasions to reflect on the Shoah. OSA (Open Society Archive) constructed an online map of the Yellow Star Houses, which functioned in Budapest of WWII similarly to ghettos in other cities. Placing memorial plaques in many of these houses provided current residents with an opportunity to contemplate their most intimately local history. Partly stirred by these actions, a facebook group was created with the name The Holocaust and My Family with the aim of sharing personal stories related to the period, which finally resulted in a carefully edited, most touching book under the same title. The Hungarian National Museum set up an exhibition titled Survivors by the Israeli photographer Aliza Auerbach. The first steps were made to establish a Skansen-like Jewish museum consisting of several apartments situated in the former Jewish district and furnished with original objects from succeeding periods. And so on, and so forth. As is evident from the random listing above, some programmes were institutionally organized whereas others started as grassroot initiatives. In certain cases – as with the Yellow Star Houses, for instance – the cooperation between the two was harmonious and mutually inspiring. However, one could often perceive a painful distance between official narratives and individual memories. This gap became strikingly visible in case of particular national ceremonies organized by representatives of the current right-wing government, who duly admitted the disastrous effects of the period in question yet tended to avoid the touchy issues of responsibility. It is true that the story of the Holocaust in Hungary is far from being unambiguous. As the recently dominant central narrative keenly emphasized, the mass deportation of Jewish Hungarian citizens to death camps started only after Germany had invaded Hungary on 19th of March 1944, in other words at a time when Hungary was no longer entirely independent. However, several anti-Semitic laws had been implemented well before that, restricting Jewish education, business and personal freedom. Furthermore, Hungarian authorities also contributed to the shameful procedure which led to the murder of almost 20 000 Jews – many of them Hungarians – in Kamianets-Podilskyi in 1941. In addition, thousands of Hungarian citizens eagerly participated in the persecution of their fellow Jewish citizens. On the other hand, these sinister events took place during a period which was disastrous for many non-Jewish Hungarians as well due to the simultaneous Nazi versus Soviet threat – and occupation, somewhat later – and the repeated redrawing of borders in the region. To make the picture even more complicated, the official national narrative of this phase in history radically changed in the past century whenever a new regime came, ranging from almost total silence to entirely opposing interpretations of the same events due to highlighting different details or aspects from different points of views and redistributing the roles of aggressors versus victims between various participants. No wonder people have grown suspicious of central narratives, and made a claim to have their say in facing their own collective memory. "Living Memorial" was started in this context as a protest movement trying to prevent the erection of a highly controversial memorial dedicated to the victims of World War II. In the meantime the group has transformed into a public discussion forum offering regular opportunities to exchange views on current local social themes. The Role of "Living Memorial"
"Living Memorial" is unique both for their strong awareness of Hungarian Jewish heritage and for their daring yet exceptionally open-minded and tolerant approach to the most crucial problems of recent Hungarian society. While most activist groups tend to stick exclusively with their own kind, "Living Memorial" deliberately enters ambiguous social spaces, inviting everyone to join their often fierce yet always peaceful, professionally moderated debates on our most pressing, common causes. 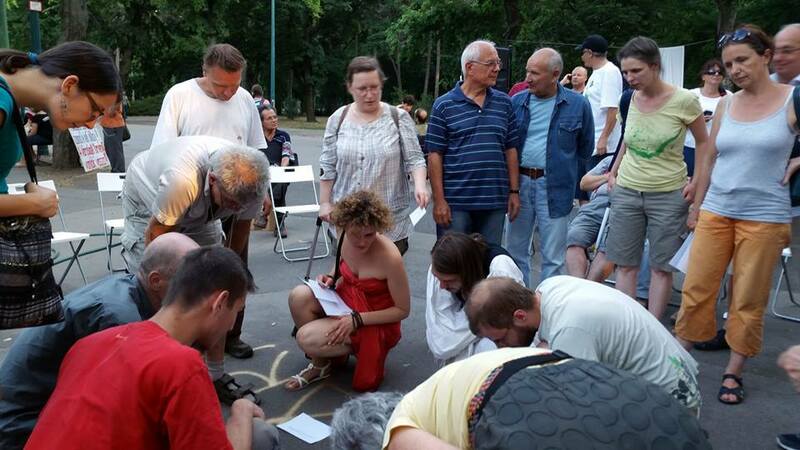 The group’s name originates from their first event: a flash mob organized against the memorial mentioned above. According to the government’s preliminary announcement, the statue was meant to commemorate the Hungarian victims of the German invasion into Hungary in 1944 – negligently skipping the tragic fact that many Hungarian Jewish citizens at that time fell victim not only to German soldiers but to their fellow Hungarian citizens as well. 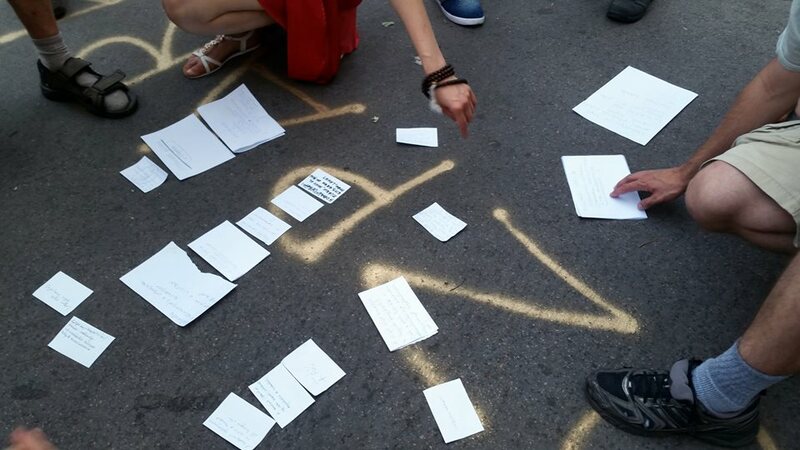 The official plan, which disclaimed responsibility and hypocritically falsified history, outraged numerous Jewish and non-Jewish Hungarian citizens alike, who expressed their views by gathering on 23 March 2014 at Szabadság tér, the site designated for the construction, in order to light candles and to place stones and small personal objects – photos, toys, letters etc. – in memory of the victims of the Shoah. This improvised collection – the product of the flashmob – was called "Living Memorial", in contrast to the planned bombastic and mendacious stone statue. I was there. After the touching moments of placing our tokens of remembrance, people stayed on. We lingered around, engaging in conversations both with friends and strangers: fellow demonstrators or random passers-by who stopped to take a look or ask what was going on. Some of the dialogues grew quite heated. Involuntarily, I happened to overhear a dispute between an elderly lady, a Holocaust survivor herself, and a man of her age, who argued in favor of the statue on behalf of the non-Jewish Hungarian victims during World War II. At some point they were practically shouting at each other, obviously releasing deeply suppressed tensions. Others joined them – not to increase but to moderate the evident strain. Miraculously, in a few minutes both of them calmed enough down to be able to start a real conversation that went beyond the usual routine of voicing one’s opinion without truly listening to the opponent’s views. They left together, still in conversation. It was clear that Hungarian society had a lot to talk about. Here is the memorial, yet it is not here. It is an ugly and empty symbol. A dead sculpture, opposite to its alternative, the anti-memorial, which is a living memorial because there are people keeping it alive by their interest, compassion and anger.